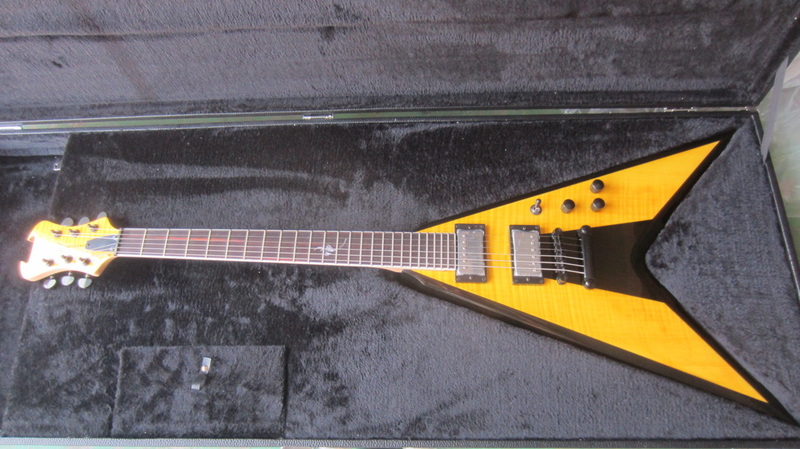 Everyone has a take on the Flying V, and for good reason... it's just a badass design all around. Even guys like Albert King and Jimi Hendrix jumped on the chance to stand out from the crowd when the first Flying V electrics to come out. 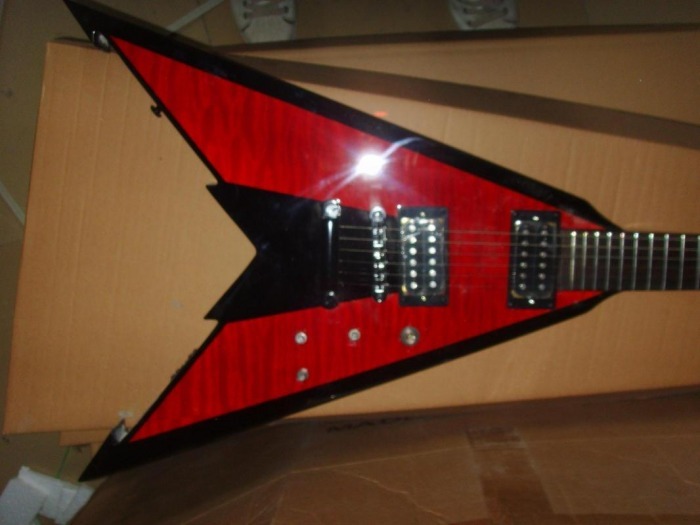 A Stolen Fireplant Leads to our Epic Custom Flying V Electric Guitar. 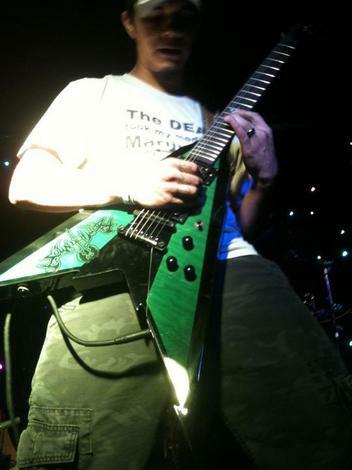 Anthony Gamez of Sound of War started out playing a Fireplant Guitars FP-1 in a see-thru black quilted maple finish. While gigging in Northern California, some a-hole busted into Sound of War's vehicle and stole Anthony's FP-1. So, how is this a blessing? It led to us building one of the best custom electric guitars that no one ever saw coming. The next day (after filing a police report), Anthony contacted us and said, "You know... this may not be the best time, but I've been working on this guitar sketch. It's like a flying V, but it's a more badass flying V with two colors and sharp edges. And since my Fireplant got stolen, I was thinking..."
Anthony sent us the sketch of his idea for the Fireplant Guitars WMD-V (he even named it himself). He described how he wanted the Black Edge paint to envelop the see-thru finish over quilted maple or flame maple - or to even just have two solid colors. As it turns out, our collective bad fortune worked out okay and we decided that now was as good a time as any to launch a new Fireplant custom flying V model. Next thing you know, we had a true, custom made electric guitar built exactly to Anthony's specs. 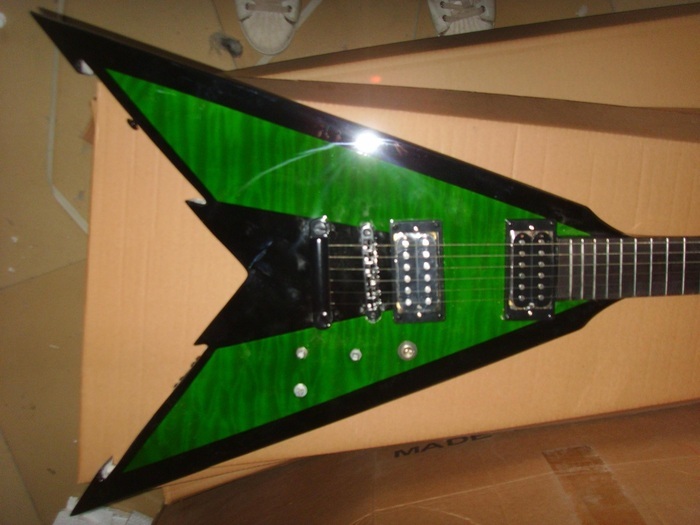 Fireplant Guitars WMD-V in black and See-Thru Green. Fireplant Guitars WMD-V Custom: black/see-thru yellow & flame maple. We agreed with Anthony that the Fireplant WMD-V would be a big hit and we put it officially into production within a week of seeing his original sketch. 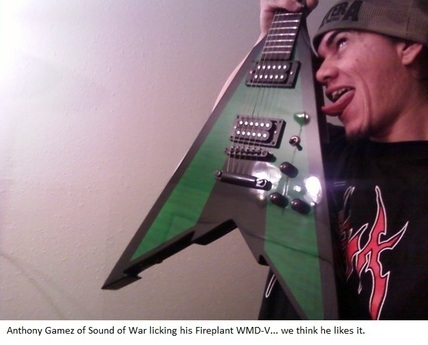 However, as evidenced by the photo, no one loves his WMD-V more than Anthony himself. 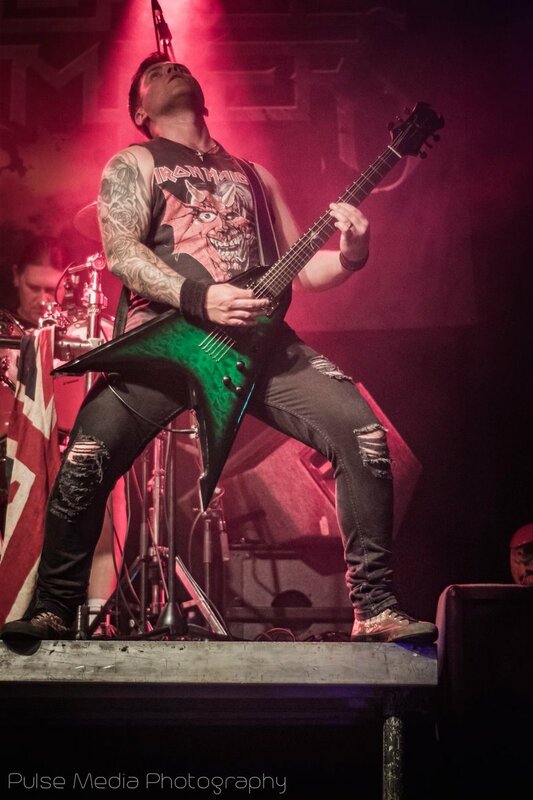 A demanding, gigging, string-abusing metal guitarist, Anthony set out with Fireplant Guitars to create the best heavy metal guitar the world has ever seen, and we also made it one of the best guitars under $1000, too, especially given all the options you have when buying it. 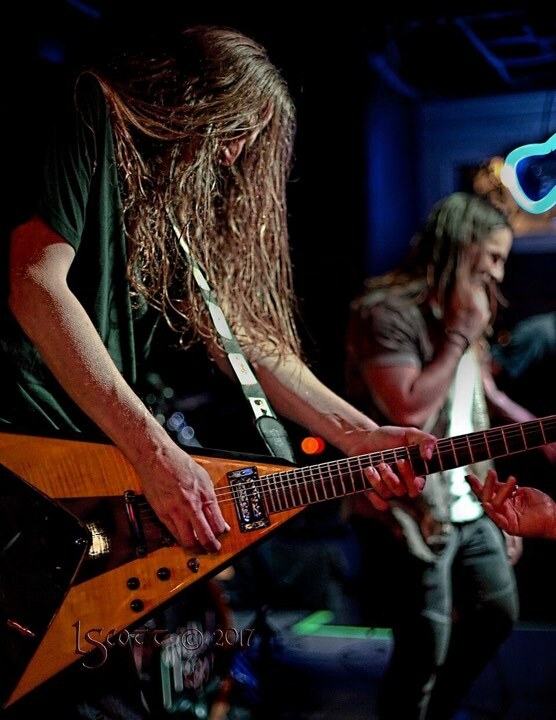 If you're a fan of the Flying V body style, then you'll love the Fireplant Guitars WMD-V. The WMD-V is unlike any other Flying V you've ever seen. Best of all, it's a custom electric guitar made to your specs (see the customizable options to the left). Combining the solid black with the see-thru finishes over quilted or flame maple gives the WMD-V a definite "holy sh*t!" factor every time you pull it out of the case and plug it in on stage. Email Fireplant Guitars to have a custom electric WMD-V built just for you... or you can have it built to Anthony's specs, too. You can trust him - he knows his way around a guitar. 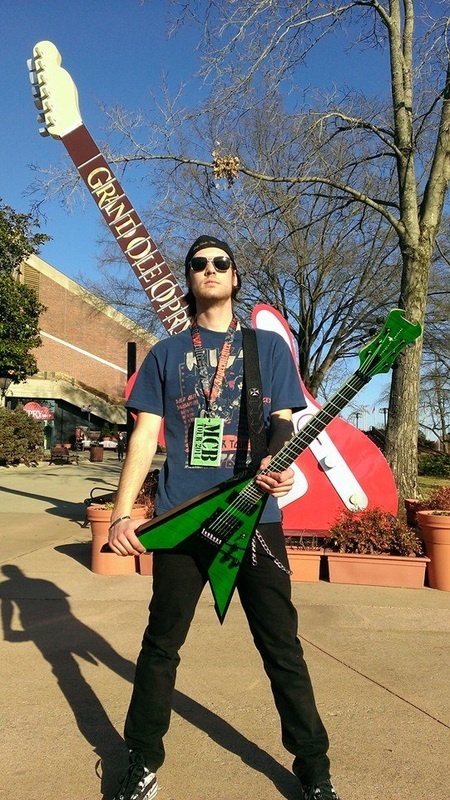 Motorcycle Cowboys' Sean Coogan showing off his Fireplant WMD-V in front of the Grand Ole Opry... Turning heads to say the least. 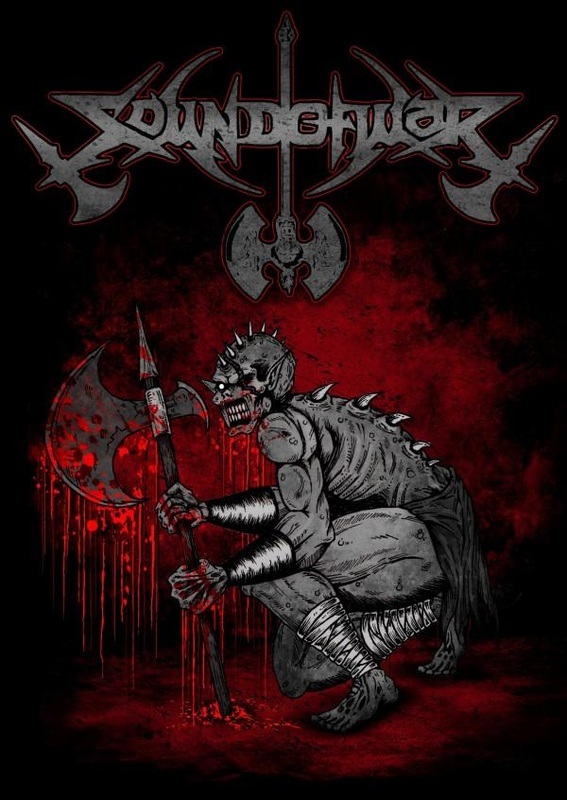 \m/ !!! 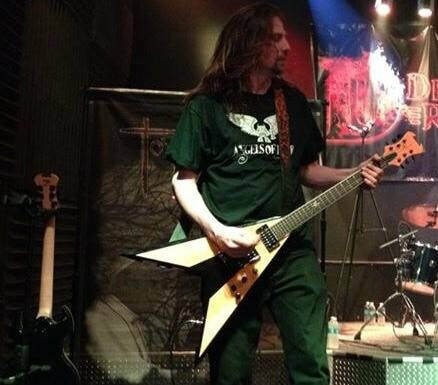 Patrick Donovan, a life-long Steelers' fan, LOVES his custom WMD-V in Black and Yellow. Anthony Gamez of Sound of War playing his custom Fireplant Guitars WMD-V in black and see-thru green on quilted maple.